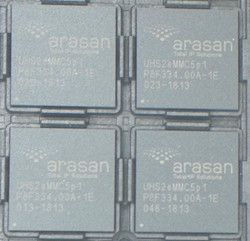 Arasan Chip Systems a leading provider of semiconductor IP expands its SD CARD UHS-II PHY offering with PHY for 12nm designs in addition to 16nm and 28nm designs. Arasan expands SD Card UHS-II PHY IP Portfolio to 12nm SoC designs. Arasan today announced the immediate availability of its SD Card UHS-II PHY for 12nm SoC designs compliant to the latest 4.1 Specification supporting sppeds of upto 3.12 Gbps. The design can be enhanced to support the latest SD Card UHS-III PHY upon customer request. Arasan’s UHS-II PHY is silicon proven on TSMC 12nm with immediate availability of Test Chips as well as a SD Card UHS-II PHY HDK for those wishing to build prototype platforms. Arasan joined as an executive member of the SD Association in 2001. The first IP Product we announced for the SD standards was the SDIO Device Controller IP followed by the Standard SD Host Controller IP. The SD IP Product line remains Arasan’s most successful product line to date. The SD Card standard is gaining rapid adoption in automobiles and drones to store data from their high resolution cameras where higher access speeds and storage are required. The SD Card UHS-II PHY is available immediately for 12nm, 16nm and 2nm SoC Designs. Test Chips based on TSMC 12nm foundry nodes along with characterization reports are available for customers to evaluate our IP and build prototype SD Cards or SD Host platforms.